Okinawan Spinach is a perennial medicinal herb/vegetable native to China, Thailand, and Myanmar. It is a member of the daisy family and a very close relative of Longevity Spinach. 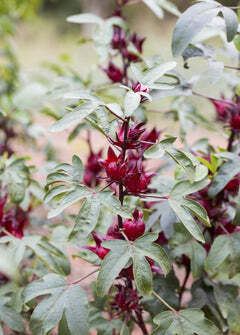 Bi-color bright purple and green leaves and young shoots can be harvested year round. Leaves have a crisp succulent, spinach like texture. They can be eaten fresh, stir-fried, blanched, steamed or as a tea and are very popular in Asian cuisine. Nutritionally, Okinawan Spinach is rich in iron and potassium, calcium, vitamin A. It also has a high content of Proanthocyanidin, which is being researched for it's ability to offer antioxidant protection against heart disease and cancer. Okinawan Spinach is a very easy perennial veggie to grow and will thrive in nearly any condition. It is fast-growing and spreads quickly. We recommend both Okinawan and Longevity Spinach to all new and experiences gardeners.